Description of "171 Days of my love story"
This book is based on the true story about two best childhood school friends Nitin and Aditi. They were admitted in the same school on the same day. Gaurav, Mukul, Sandeep and Amit were the friends of Nitin. Nitin wanted to be an engineer while Aditi wanted to be a doctor. With the flow of time, the distance between Nitin and Aditi decreased and Nitin fell in love with her. Though he was not sure that if she loves him or not. He just tried to hide his feelings from her because he did not want her to know about his love. But his best friends knew about the feelings of Nitin. He used to write all his feelings in his personal diary. After completing their 10th standard, they were promoted to higher studies and were allowed to choose their specific stream. Nitin chose Mathematics and Aditi chose Biology. But they joined a same coaching institute for other common subjects. A new boy came into the frame named Krishnakant who soon became good friend with both of them. His interaction with Aditi was bothering Nitin. One day Krishnakant gave Nitin a shock telling him that, he loves Aditi and she loves him too. This was a bolt from the blue over Nitin. He was completely broken from inside. He made distance with Aditi. But destiny wanted something else. One day at Army camp, Aditi told Nitin that she never loved Krishnakant, though he was scandalizing her in the school saying that she was his girlfriend to create a pressure on her to accept his proposal. Revealing of that fact gave Nitin a ray of hope to get back his love which he lost a year ago. Like a Bollywood hero, he warned Krishnakant to stay away from her or he will kill him. But he was afraid to share his feelings with Aditi until he was sure about that she too loves him. But his best friends came to a rescue. They stole his personal diary and handed it to Aditi. She read the diary and returned it back to Nitin with a smile on her face. She came to know how Nitin sacrificed his love for the sake of her happiness. That smile made Nitin feel that she too loves him. One day Nitin decided to finally propose her and reveal her the feeling he had locked up in his heart. With the help of his friends, he proposed her. She accepted his proposal and the journey of their love story started. How did their love story turned after that? Did their love story succeed? What does the writer meant by the title, “171 Days of My Love Story.” To know the answers read the full story of childhood friends turning lovers. A final year mechanical engineering student by profession. He is interested in PC Multiplayer Gaming, Chess, Table Tennis, Website designing, Automobiles, Computer technology and Photography & editing. His interest in writing was at best during his third year. 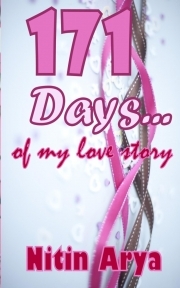 Reviews of "171 Days of my love story"
A must read story of best friends. Best childhood friends turning lovers. I liked the role of Nitin's best friends how did they help him in getting his love.